It's Tracey here to share the details of my projects created with the August Kit. This is my farewell post for ScrapThat! 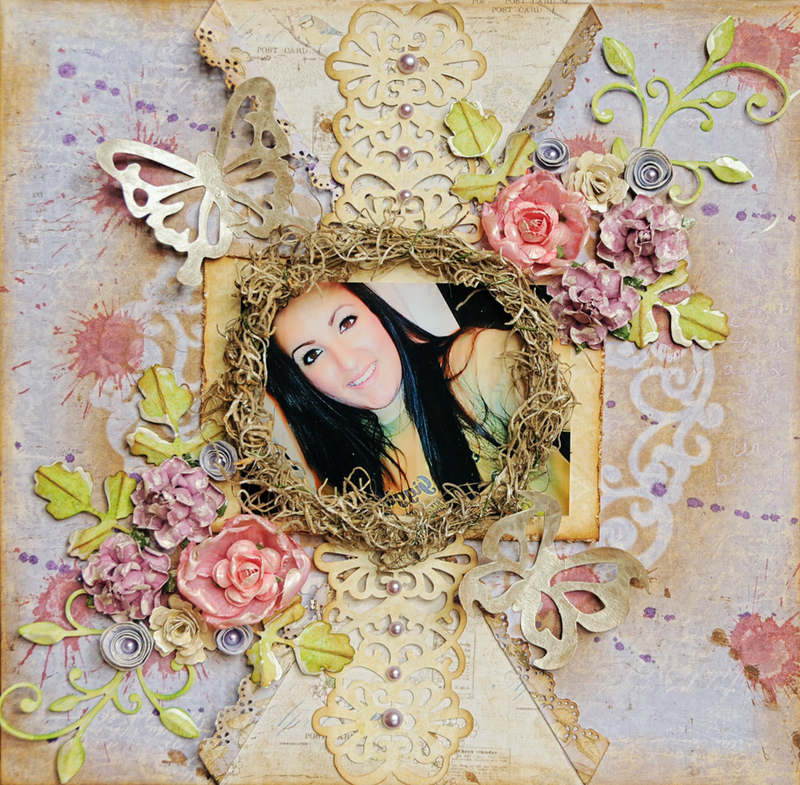 I know Kaitlyn's beautiful ScrapThat! Kits will be missed. I've enjoyed the opportunity to work with them each month this past year. It has been amazing working with each of the talented and sweet designers as well. If you are interested in purchasing ScrapThat! contact Kaitlyn Eves at Keves1@telus.net. I just adore this sweet photo of our Elizabeth when she was a little babe with her lovely smile and silly hair sticking up. Yes, this is the same Elizabeth in all the wedding layouts I've been creating. This page was created with the main kit only. 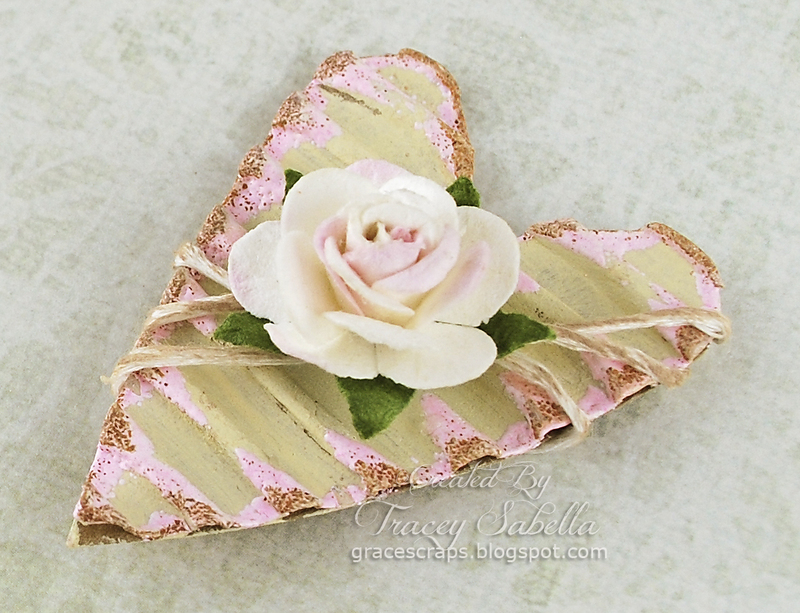 This white focal flower was created with the rose petals included in the kit. 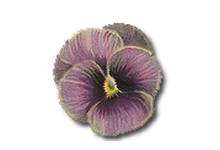 The pink and purple flower surrounding it and around the page are also included. 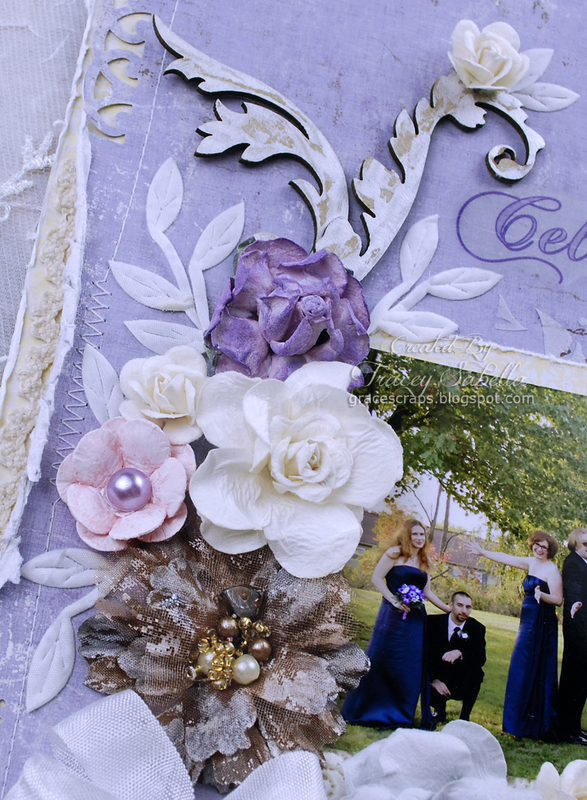 The flowers are dry brushed with gesso and microbeads added to the printed flower centers for dimension. I cut off a strip of the Pink Paislee circle mat, painted it with gesso and crocheted lace onto it. I divided a few of the pink flowers for mini rose buds and placed one of the kit lavender pearl into the center of the larger blossom. 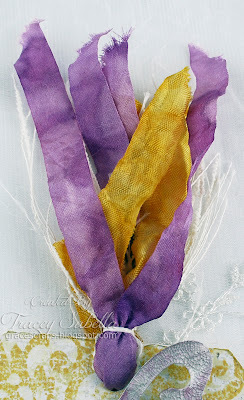 Under the photo I tied a scrolled jewelry link from my stash with white organza ribbon. 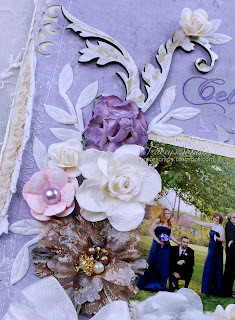 I fussy cut the floral frame from this gorgeous Maja paper and hand stitched a border. This medallion piece is another jewelry finding. I cut mini banner flags and added a rose but and roses cut from the kit lace. 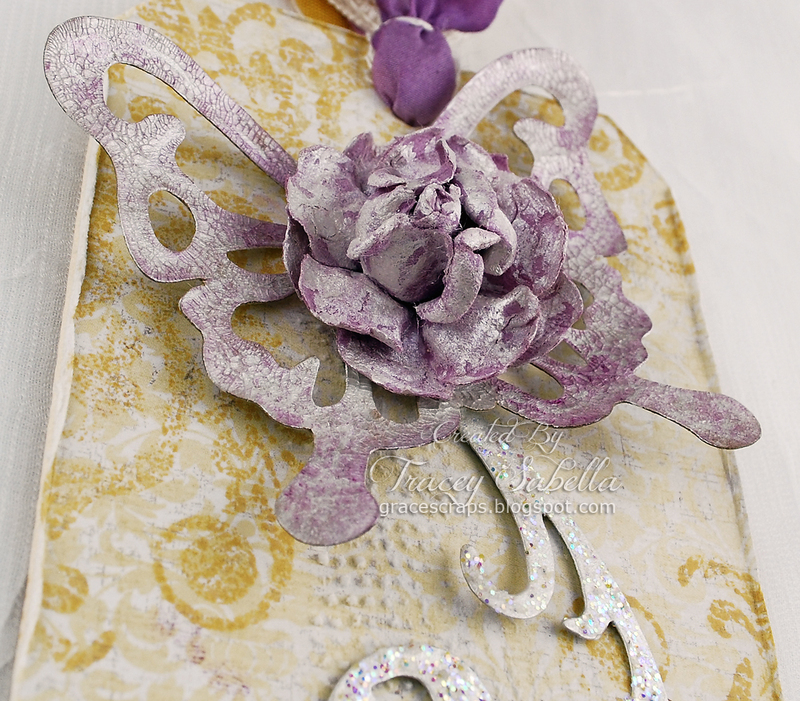 This kraft Maya Road butterfly was altered by topping with Fran-tage embossing powders and glitter. Kit lace tucked into the corner embellished with kit pearls. Such a fun photo from Elizabeth and Andrew's wedding. I used the entire package of pearl trinkets in the EAO kit along with decorative links from my stash to create this jeweled banner. 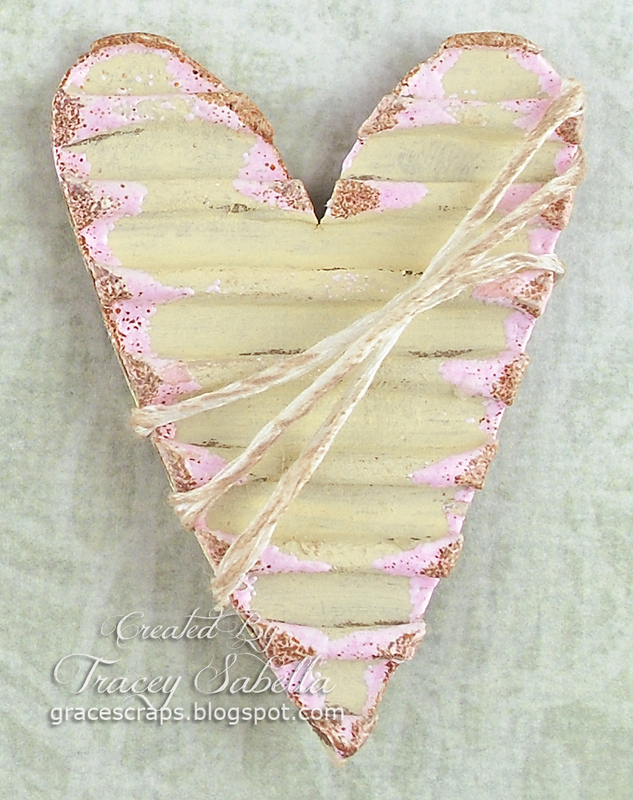 A tutorial for my Twine Wrapped Corrugated Heart can be found here. The FAK and MK flowers created a gorgeous cluster. I stenciled with molding paste under the flowers and tied a four looped bow with white seam binding. The top of the cluster with more MK and EAO Kit flowers. 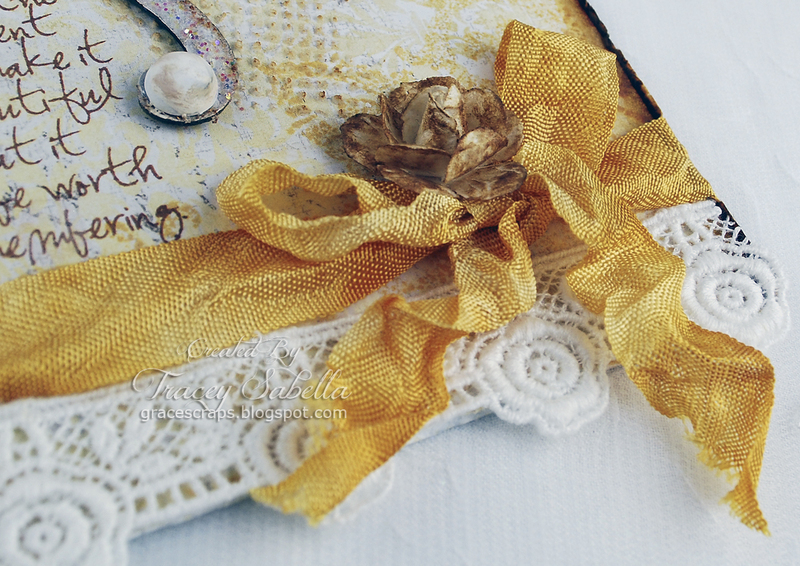 The DA Chipboard and May Arts Leaf Ribbon is from my stash. This sweet butterfly is in the main kit. I brushed on Stickles and added a pearl flourish from my stash. 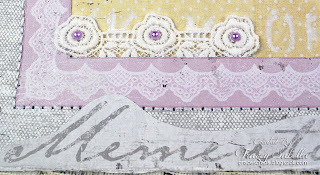 Machine stitching and random punches are added around the border. I created these two tags from the gorgeous Maja collection and items from the MK, EAO, and FAO Kits. 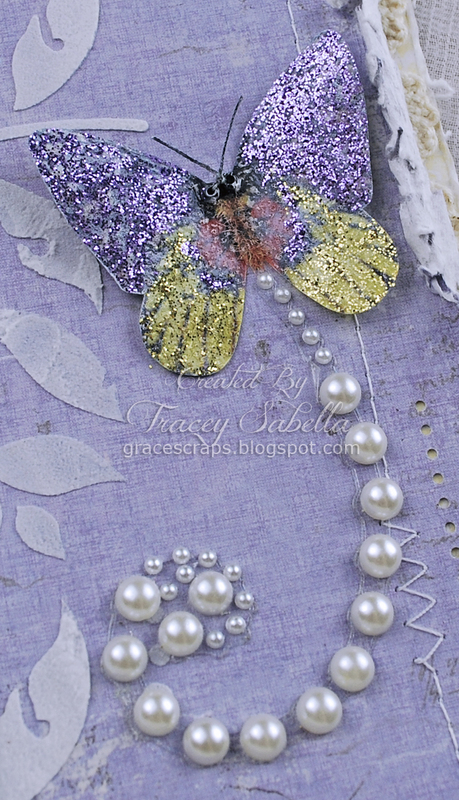 These Maya Road butterflies are so beautiful and take mixed media well. I painted with gesso, then crackle medium. I let the crackle dry overnight, then rubbed ink into the cracks. 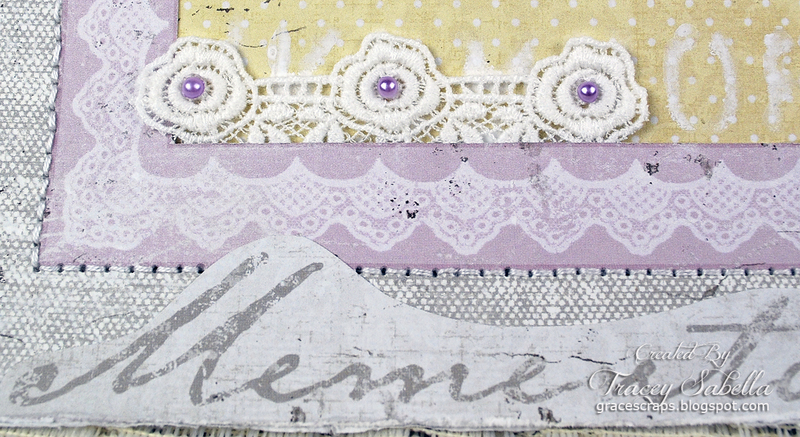 I stamped flourished onto the corners of the tags in coordinating ink. This flourish was die cut and painted with Ice Stickles. 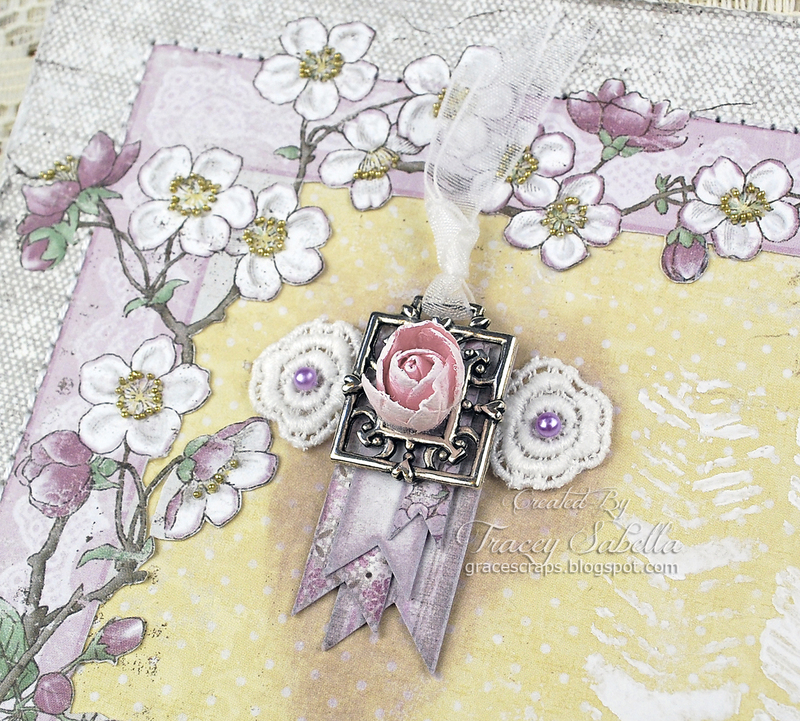 The purple rose was dry brushed with gesso. I used the same mixed media techniques on this butterfly, but used yellow and brown inks. This flourish is included in the kit. I just cut off the bird and set aside for another project. I added kit pearls which are painted and inked to distress. On the background I added molding paste over a mesh, then touched with ink to bring out the dimension. I added the kit lace to the bottom of both tags and for this tag, tied dyed seam binding and placed an inked kit flower in the bow. I dyed seam binding and wrinkled ribbon to coordinate and added in white mesh ribbon to tie at the top of each tag. Thanks for dropping by to see my work with this gorgeous kit. 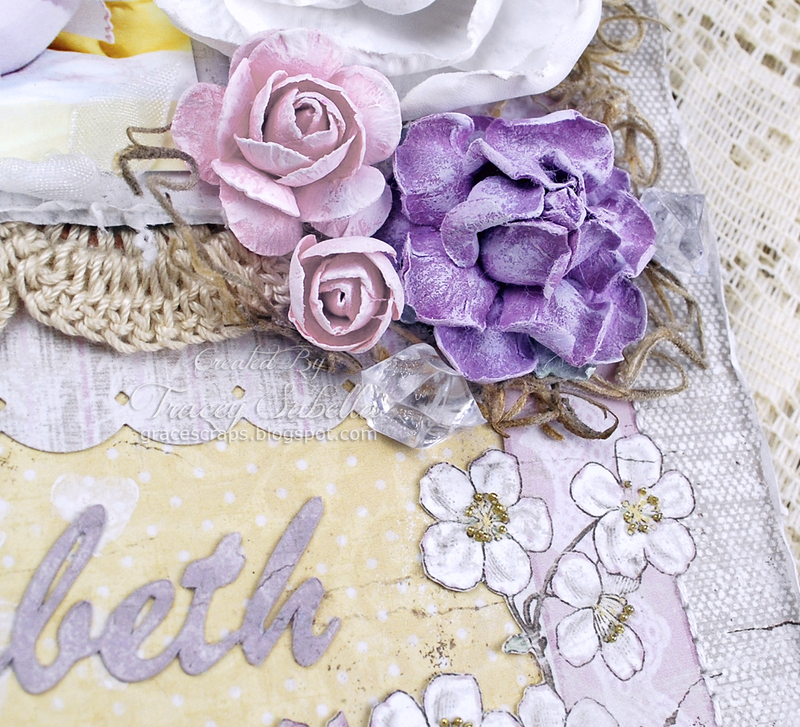 The August kit and all remaining retired kits and add-ons can be purchased in the ScrapThat! Store. 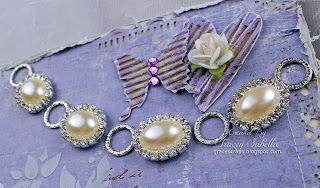 It's Tracey here to share my final tutorial with you. 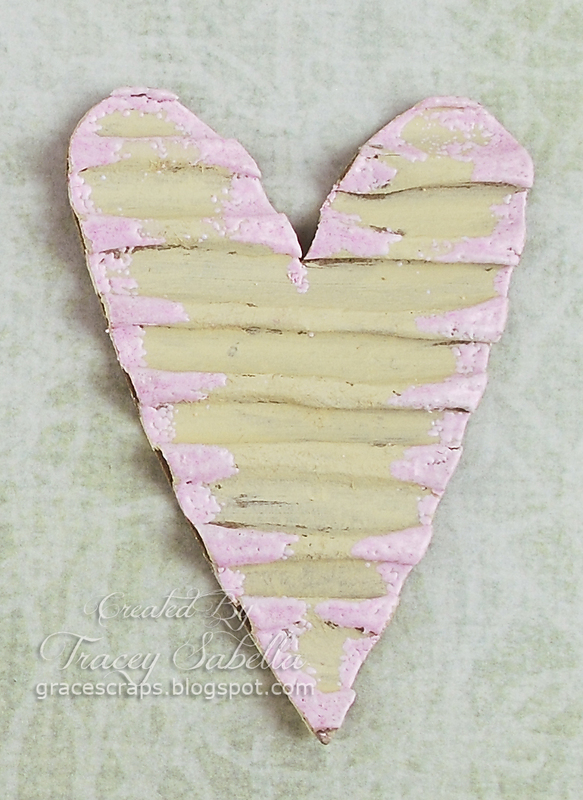 I included an embellished corrugated heart on my August Kit project "Celebrate"
My heart in the tutorial is a little different than the heart pictured on this project, but the steps are the same. 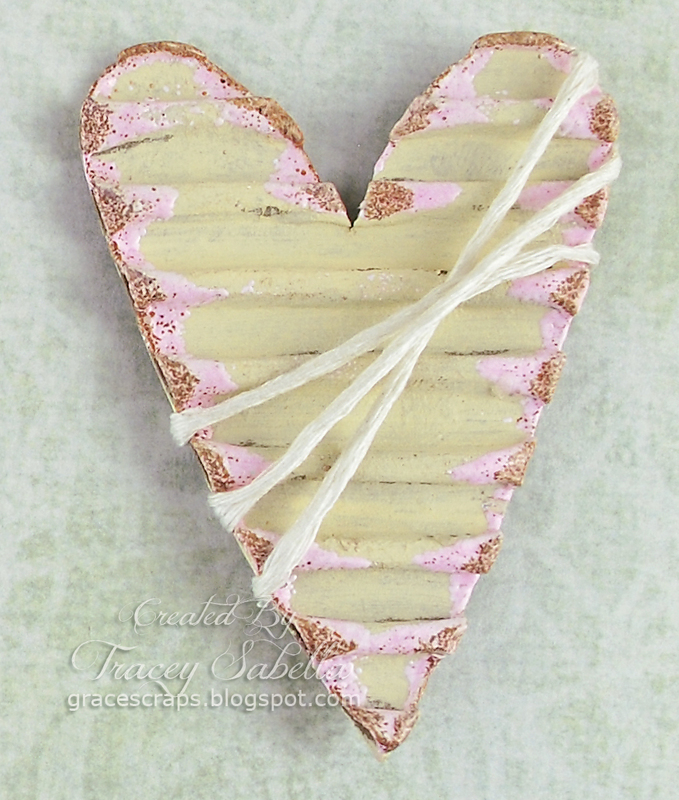 Tweezers (Optional but helpful for holding heart during embossing. 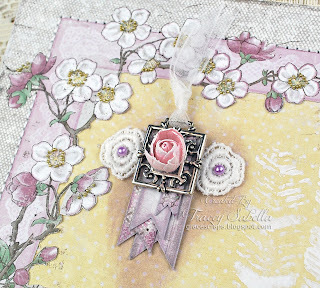 Small Flower - I used one of the white roses from the Main Kit. 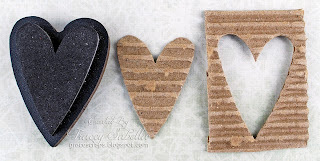 **Note** If you do not have a heart die, you could also hand cut a heart from corrugated board. **Note** There are many different sizes of corrugation from the tiny ridges in postal boxed to the larger ridges in the corrugated board I used here. Use what you have available and what goes with your project. Step 1. 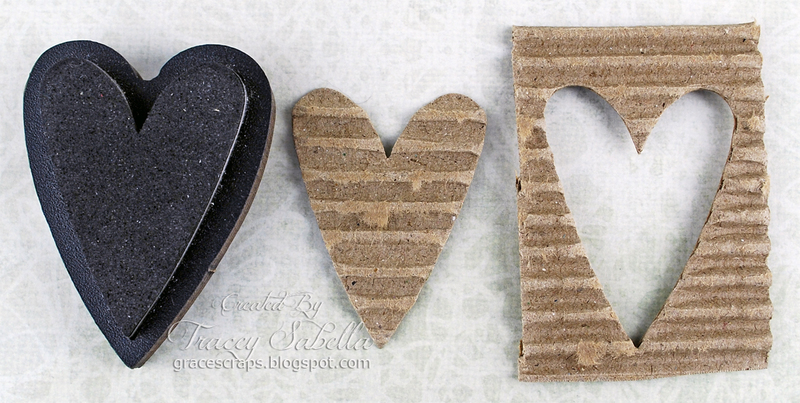 Cut heart from corrugated board. Step 2. 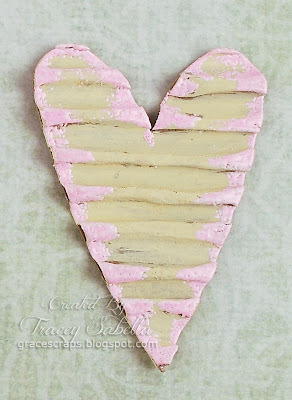 Paint heart to coordinate with your project. 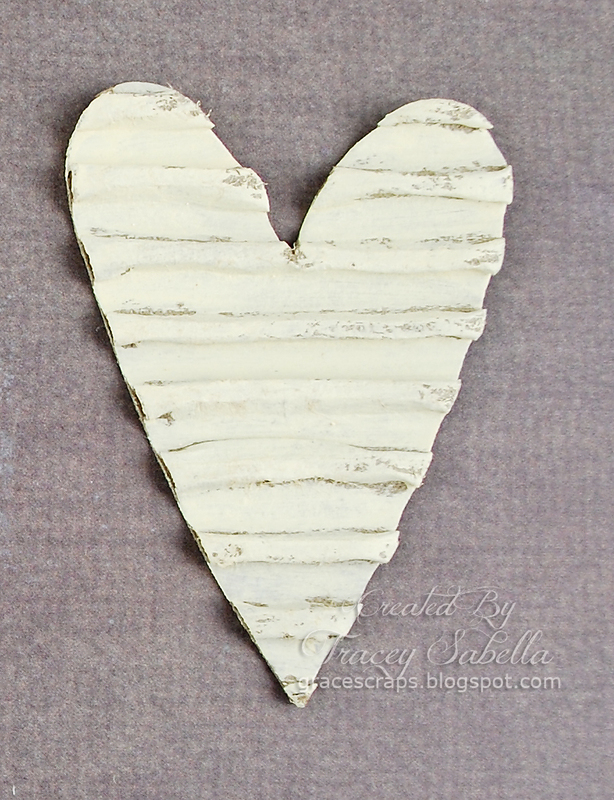 Here I used DecoArt Americana Buttermilk craft paint. I often use white gesso as well. Sometimes I just paint the top of the ridges leaving more of the natural corrugated kraft color showing. Here, I left some small areas of the natural kraft color showing for a more rustic feel. If you want to just paint the tops of the ridges, dry brushing with a foam brush works best. Step 3. Select an ink for your primary color. 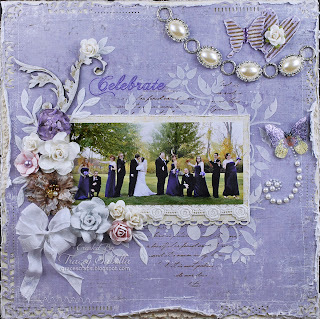 I used Mix'd Media Inx and embossing powder in Chiffon. Ink the edges of your heart, drawing the ink towards the center, but not completely covering the heart. While your ink is wet, sprinkle with coordinating embossing powder and heat set. 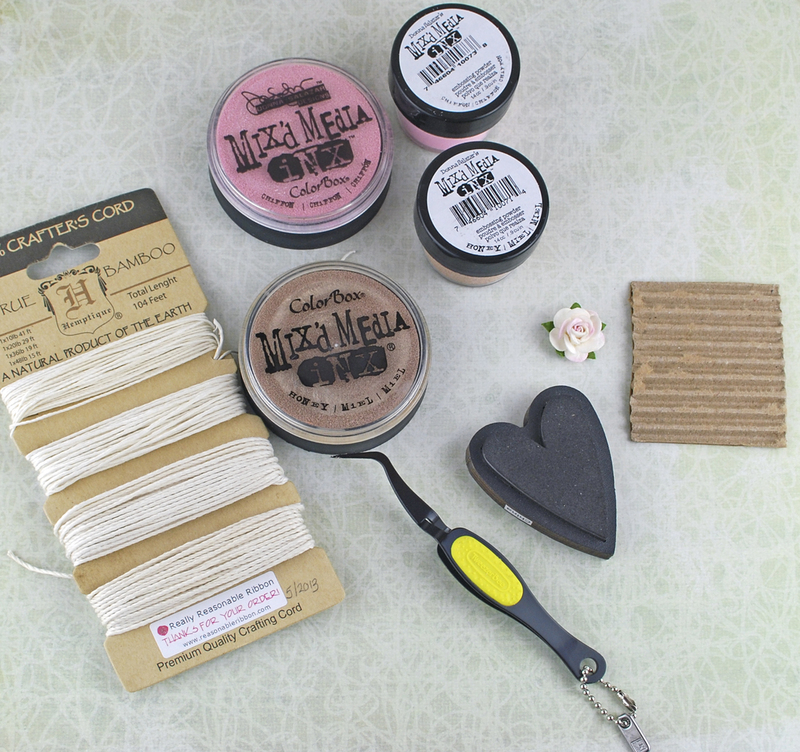 The heart is small, so a pair of tweezers comes in handy to hold it while heat embossing. 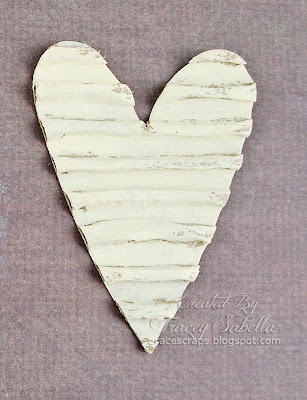 If you desire a more rustic look, you can just ink without embossing like I did for the purple heart on my project. Step 4. Select a contrasting ink for your edges. 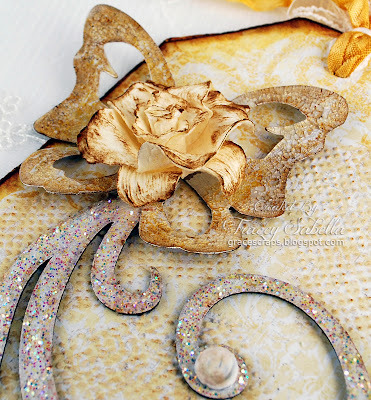 I used Mix'd Media Inx and embossing powder in Honey. 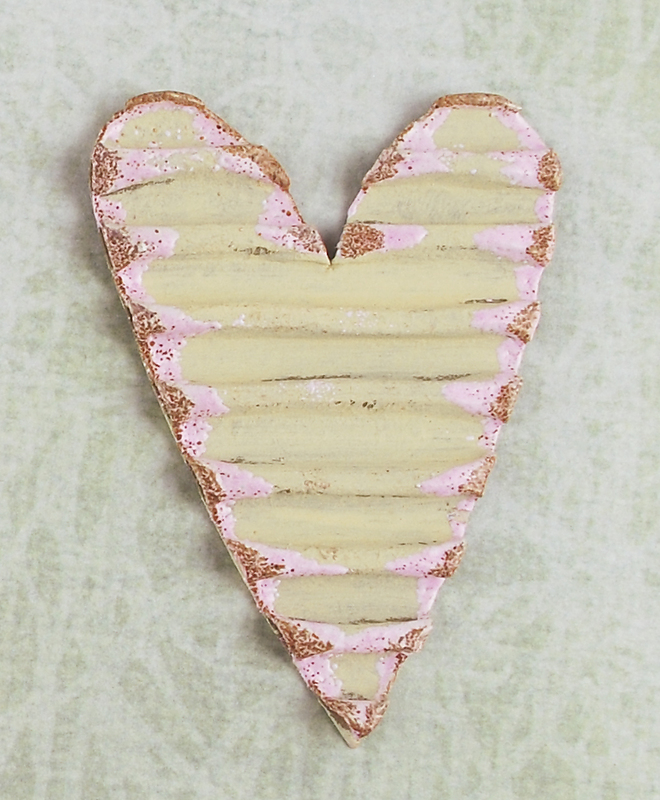 Just dab a little ink on the very edges, then sprinkle with embossing powder and heat set. Step 5. 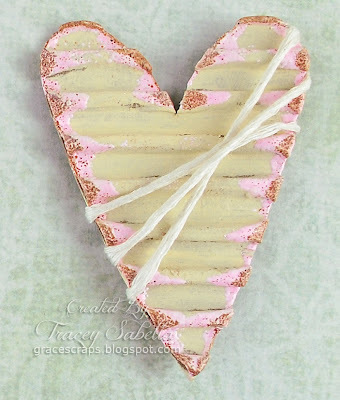 Wrap twine around your heart and glue ends to the back of the heart. Step 6. Rub ink on the twine. I used Mix'd Media Inx Honey. Step 7. 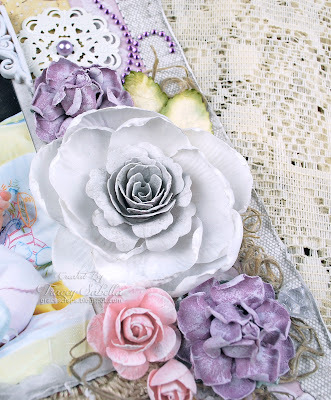 Select a small flower that coordinates with your project. The ScrapThat! 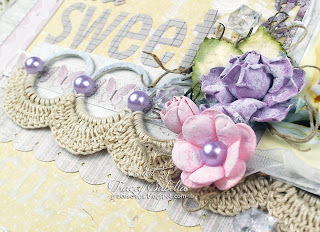 August Kit and Add-ons can be purchased in the ScrapThat! Store. When I opened my kit and saw the Spanish moss, I was stumped, because I live in Florida and the stuff grows wild on my trees. I am always pulling it off in bunches as it chokes the life out of my smaller trees and tossing it in the fire pit. How could something so pretty be so deadly!! I thought of making little birds nests until the idea came to make a small wreath to frame a photo. It worked out perfectly. I saved the clipped wires from the flowers and used them to adhere the moss to a card board circle I created from the packing box. That box our kits came in sure came in handy in more ways than 1!! I added the Smooch paint to the flowers and leaves. With the smaller scraps of paper, I made some tiny rolled roses. and added a pearl to each center. I die cut some smaller vines. Here is a closeup of the Spanish Moss wreath. I love my Martha Stewart deep edge punches. This decorative strip was made by punching both sides of the paper strip. I added the pearls down the center. Just another closeup of the flowers. I created the tiny blue rolled roses from the scraps of extra paper I cut away. Then just added a half pearl to the center. All I did to the butterflies were paint them with the Smooch and curled up the wings a bit. I only adhered the body to the paper and as the paint dries, the wings curled on their own. One more closeup of the opposite corner. 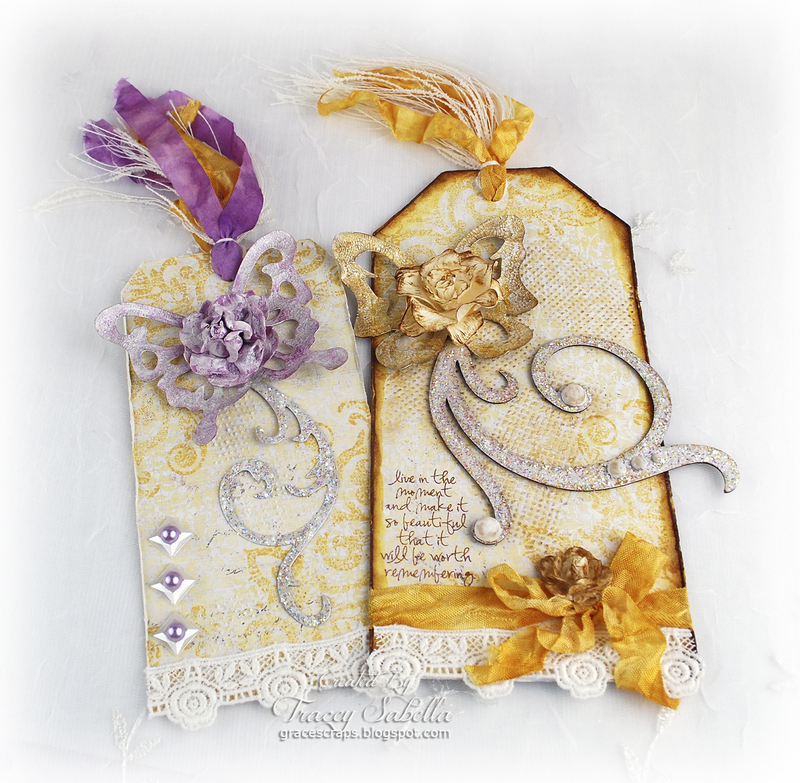 To view more of Lisa Gregory's fabulous work, stop by her blog, What a Beautiful Mess. 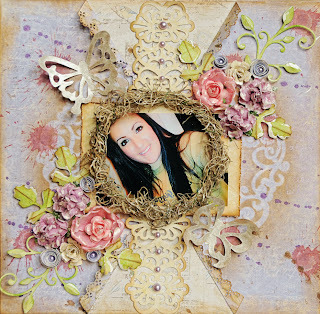 Amarilys here today sharing with you the projects that I made with the ScrapThat! August "Days To Remember" Kit. This kit is simply gorgeous and filled to the rim with scrappy goodies! 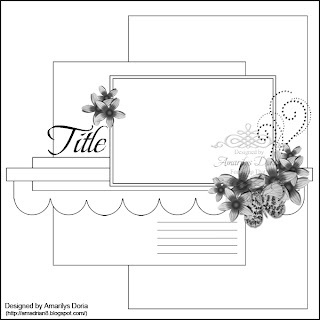 My first layout is based on my sketch for ScrapThat! August Kit. My first layout is based on my sketch for this month. I used the Main Kit Only for this layout. Picture is of my hubby and I at the park where we got married 1.5 yrs after our wedding. I handmade the white flower I used here. You can find the tutorial on my BLOG. My second layout is of my adorable niece Amy Helen. She is now 7 months old and growing so fast! She was only 3 months old on these pictures taken during Easter 2013. 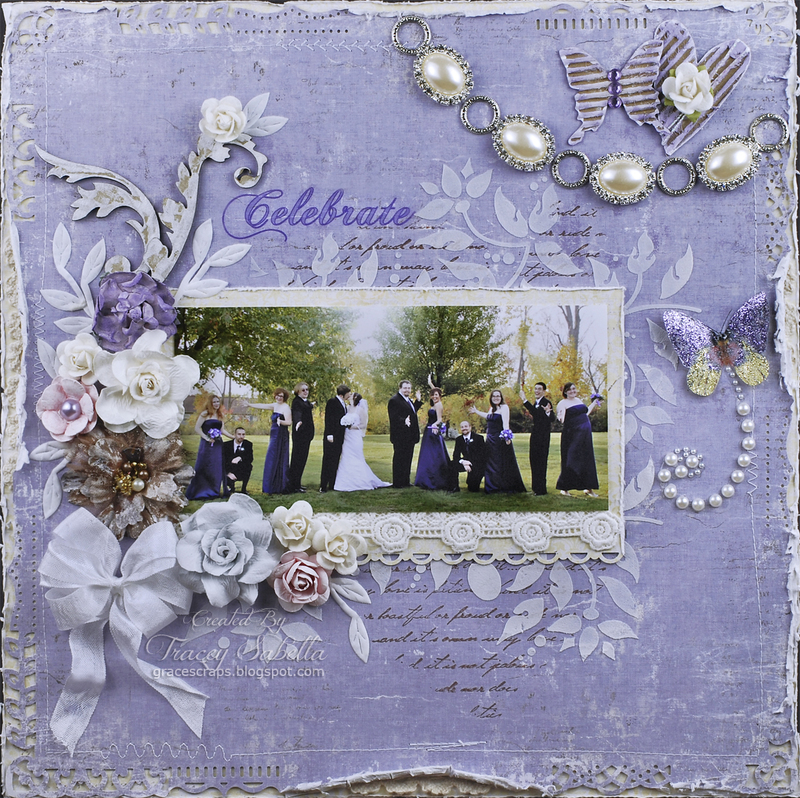 I used the Main Kit, FAD and EAO for this layout. 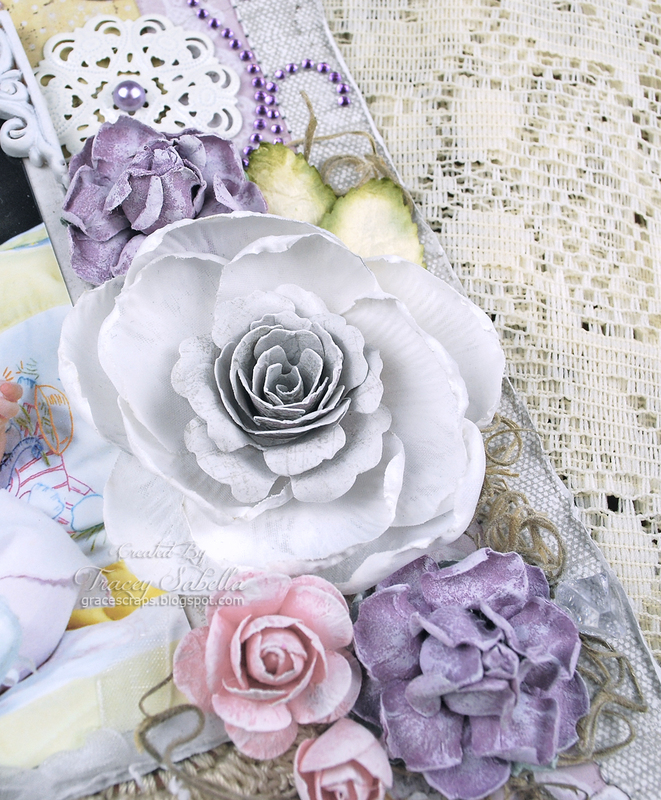 The doily is from my stash. Her tutu matches perfectly the flowers and papers on this kit! My last project with this kit is a gift card set with a gift box. I used the Main Kit Only for this card set. 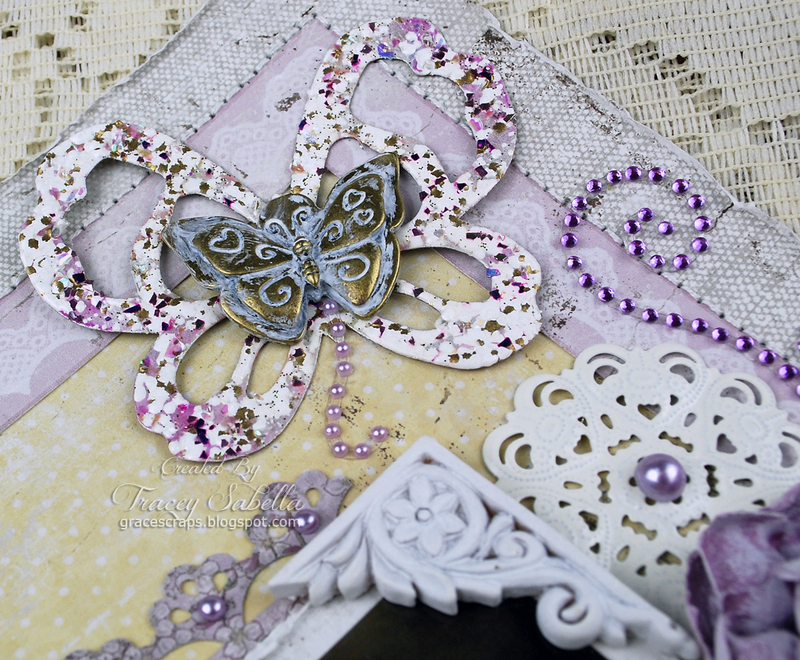 The purple cardstock on the box and small butterflies are from my stash. I love how this set turned out! Since this is my last post for ScrapThat!, I want to thank Kaitlyn for having me be a Sketch/Layout designer for the past year and a half. I really appreciate the opportunity you gave me. To my fellow DT members, thanks for your hard work and I'll keep in touch with you all through your blogs. I wish you all the best in your scrappy endeavors. Tracey S, you are an amazing DT leader! To the ScrapThat! Community, you gals are all amazing! Thank you for your support in the monthly sketch challenge. I'd love it if you stopped by my blog and maybe become a follower. I'd love to keep in touch with you all as well. I'll miss working with you all! 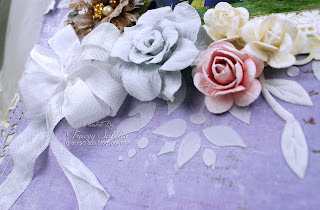 Trash to Treasure with Tracey G.
August Kit Projects with Tracey G.